Have to write another article on inheriting collections. Don’t think I gave a satisfactory answer to this very interesting question: are you doing your kids a favor by passing on your collection to them? Can you love a collection that you inherit, particularly one that is not easy to maintain? A few weeks ago, on a beautiful Sunday morning, a few hundred enthusiasts gathered at the ITC Windsor, Bangalore, for a vintage car rally that lasted all morning. I went to answer a question that had been puzzling me for years: Can you love a collection that you inherit, particularly one that is not easy to maintain? Collecting, I get: hunt, find, own. Cars, I get: the petrol fumes and orgasmic “vroom”. I understand the seduction of owning old things, which have stories to tell and previous lives to reveal: antiques, heritage, vintage, call it what you will. Vintage cars have all three. Is inheriting such a collection a privilege or a pain? Rupali Ravi Prakash, 24, makes it sound like a privilege. A slim girl clad in a simple jeans and T-shirt, she stands to inherit 180 vintage cars, collected by her father, a cardiothoracic surgeon, Dr Ravi Prakash. A Bangalore girl who attended the liberal Valley School, she addresses people politely with a “sir” or “ma’am”. She develops board games for a living, and markets vintage car memorabilia through her own brand called Roadster. If you passed her on the street, you would not guess that this girl rode a 1907 Locomobile at age 2. Rupali is passionate about vintage cars. She grew up around them. Her father, called “Doc” by the vintage car world, began with a Sunbeam-Talbot 1937, willed to him by (father and daughter repeat this frequently to the press) General Mahadevan of Chennai. Since then, Prakash has amassed 180 cars, housed in “Kala Farm”, outside Bangalore. Their collection, says Rupali, includes cars from “every era—Edwardian, Veteran, Vintage as well as Classic cars, right from an 1886 Benz Patent-Motorwagen (the first gasoline-powered automobile), to Jaguars, Rolls-Royces, Mustangs, Delages, Mercedes and so on”. This must mean something to some of you vintage car buffs, but I was only trying to figure out if all these cars were awe-inspiring or ache-producing. Well, her father is a doctor so he’s got that covered, I guess. Fifteen men work full-time on these cars—tinkering, repairing and sourcing parts from all over the world. On weekends, and this is the best part, they get to take these vintage cars out for joyrides along country roads. Riding in these beautifully detailed automobiles is a thrill. They make you feel like Grace Kelly, or Gayatri Devi. “There is only one reason to do this: passion,” says Rupali. Her father, a genial, smiling man clad in a cowboy hat and black pants, organized the rally, which ended with lunch at the ITC Gardenia. The large banquet hall was filled with men wearing shirts with cars designs on them and cowboy hats. Both Rupali and Dr Prakash list their invitation to the Concours d’ Elegance, a vintage car rally at Pebble Beach in California, US, in 2012 as one of their proudest moments. Another vintage car enthusiast at the event estimated the cost of transporting two vintage cars from Bangalore to Pebble Beach to be about Rs.50 lakh, maybe more. I didn’t want to ask the owners. It’s like the old saying: If you have to ask the price, you just don’t get it. Asking a vintage car collector the cost of transportation is like asking a Bordeaux wine collector about the cost of cork: a bit tasteless. At Pebble Beach, Prakash drove a 1930 Delage and Rupali, a 1907 Locomobile. “To be the only Indians with two car entries was a proud moment for us and a lifelong dream for my father,” says Rupali. Across the country, in Delhi, I visited another inheritor of vintage cars. Anubhav Nath, 35, who is the director of Ojas Art gallery and a co-founder of Ramchander Nath Foundation, a think tank with a focus on the arts. He has a lovely property at Mehrauli in the shadow of the Qutub Minar. Nath, who prefers not to put a number on his collection, has a 1912 Silver Ghost Rolls-Royce, a 1916 Buick, a 1936 Maybach from the Maharaja of Patiala, a rare 1930 Delage, a 1955 Chrysler Imperial that was gifted by King Al Saud of Saudi Arabia to Jawaharlal Nehru during his state visit to India and later acquired by Nath’s grandfather, in his shed. Nath’s favourite is a 1926 Rolls-Royce Phantom I, “as I remember playing taxi-taxi in it all the time,” he says. Childhood memories: that must be it. Happy memories of grandfather working on the car while grandson plays in the car. That must be why these heirs care for the cars and the collection (once you take out commercial reasons, that is). It is the same with Rupali. She probably associates the cars with family, laughter, and nature. 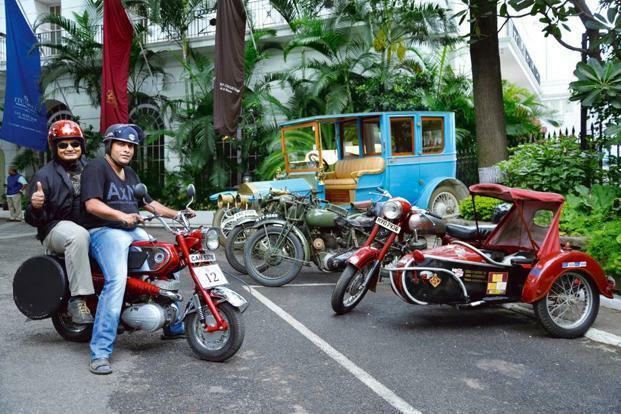 Shoba Narayan is happy to ride in vintage cars—that she doesn’t own. Then again, she might feel different if she were mechanically inclined. I, Archit Beri, am currently pursuing B.Arch as a final year student from Aayojan School of Architecture, Jaipur. I have a keen interest in Automobiles and am therefore taking up Automobile museum for my thesis project. After reading your comment, I figured out that you also proposed something similar for your thesis. Is it possible for you to share any possible data regarding the site and the requirements with me? Will you please provide me the e-mail I.D or cell number of Dr. Ravi Prakash secretary KVCCC Bangalore. I wanted to collect information regarding tyres for my vintage car. Dear Mustafa: I only met this gentleman at the event. Don’t have his contacts sadly. On 15th of august 2014, there was a vintage and classic car rally in Hyderabad, I saw one Cheverolet car with new tyres, I contacted the owner, from where you purchased these tyres, he said that Dr. Ravi Prakash was king enough to supplied me. I asked him to give his contact number, but that said person said that he is having his personel number, didn’t gave to me. I am having 1949 Austin of England A40 Devon four door, I need tyres for my car the size is 500-525/16 firestone big white wall. If you have contact regarding my queries, kindly help. Thank You very much for your co-operation. Hope some day we will meet. I reside and practice as a Lawyer in Hyderabad. Telangana.